U.S. retail sales rose by less than forecast in August after an upwardly revised July gain as purchases of automobiles and clothing fell, suggesting households took a breather from spending. The value of overall sales climbed 0.1% from the prior month after a 0.7% increase in July, Commerce Department figures showed Sept. 14. The median forecast of economists surveyed by Bloomberg called for a 0.4% gain. Combined results from July and August indicate support from a strong job market and more after-tax pay during the back-to-school shopping season. While household spending, the biggest part of the economy, continues to drive economic growth this quarter, still-tepid pay gains and higher borrowing costs are among reasons why it is projected to cool from its second-quarter pace. With the revisions to July, “The net result is fairly strong spending growth so far” in the quarter, Jim O’Sullivan, chief U.S. economist at High Frequency Economics Ltd., said in a research note. A separate report Sept. 14 from the Federal Reserve showed U.S. factory production rose in August amid broad-based gains that included automakers, providing support for economic growth this quarter. The retail sales figures aren’t adjusted for price changes. 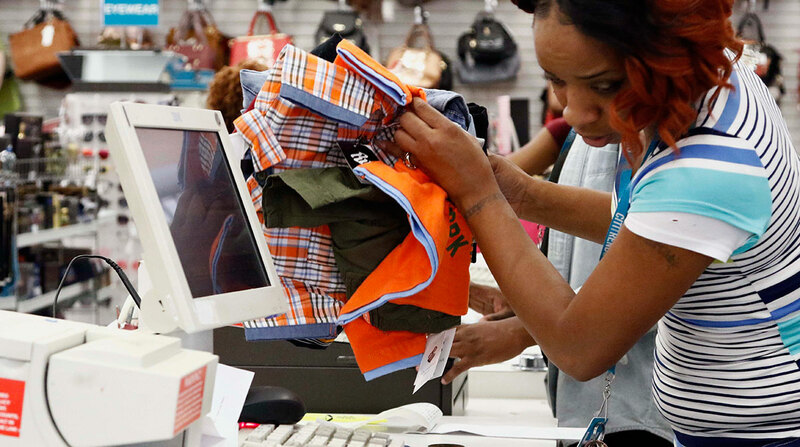 The data indicated that the biggest plunge in clothing prices since 1949 depressed August results, at the same time as higher gasoline costs gave them a boost. Sales fell 1.7% at clothing stores, the biggest drop since February 2017. In contrast, receipts climbed 1.7% at filling stations as Labor Department consumer-price data showed seasonally adjusted gasoline prices increased 3%, the most since April. Estimates for retail sales in the Bloomberg survey ranged from a decline of 0.1% to a gain of 0.7%. So-called retail control-group sales — which exclude food services, auto dealers, building-materials stores and gasoline stations — advanced 0.1% after an upwardly revised 0.8% gain. The median estimate was for a 0.4 % increase. Sales at auto and parts dealers fell 0.8%, the most since February, after decreasing 0.1% in the previous month, the Commerce Department data showed. According to industry reports for August, except Ford Motor Co., all major automakers’ sales missed analyst estimates as demand plunged for passenger cars. Excluding autos and gasoline, retail sales rose 0.2%, after an upwardly revised 0.9% gain the previous month. The results also got less of a boost from restaurants and bars after three months of outsize gains. Receipts at food services and drinking establishments cooled to a 0.2% increase in August, after an upwardly revised 1.6% in July. Economic data, including on retail sales, may be distorted in coming months depending on the extent of damage and flooding from Hurricane Florence. Even with the slower gain, nine of 13 major retail categories showed increases, according to the Commerce Department data. The advance was led by a 2.3% rise at miscellaneous stores. Nonstore retailers, which include online vendors, rose 0.7% after a 1.5% increase. Health and personal care stores, along with electronics and appliance sellers, also saw gains. With assistance from Jordan Yadoo.